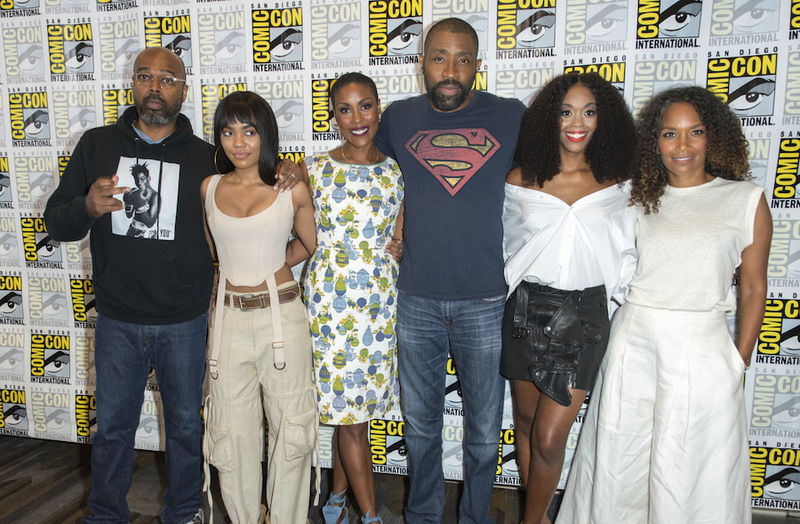 "Black Lightning" at Comic-Con '17: Shaking Up The Superhero Genre! When 2018 hits, the world will be introduced to a new superhero: Black Lightning. Based on the DC comics of the same name, “Black Lightning” will be a brand new CW show centered around a retired superhero who, after seeing the effects of a local gang, dons his superhero attire once again to fight for justice! Black Lightning (aka Jefferson Pierce) isn’t your average superhero exactly -- he has two daughters who also have superpowers, and an ex-wife whom he’s desperately trying to win back. The series will not yet take place in the same verse as the other DC/CW shows, but that’s not to say the two won’t ever cross paths! 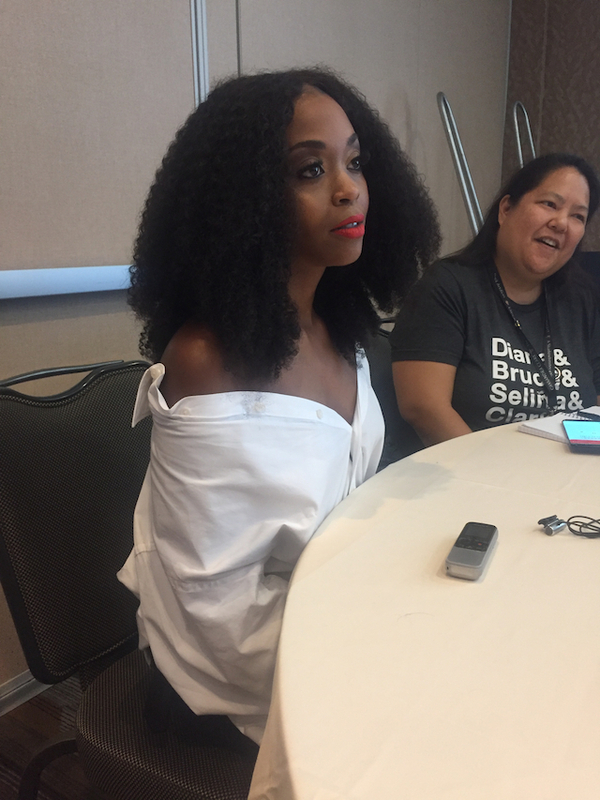 During Comic-Con, the cast and crew took some time out of their busy schedules to fill me in on what it’s like bringing a black superhero to network TV, how training is going, and why Black Lightning is like President Obama! YH: How does it feel to play the first major black superhero on Network TV? 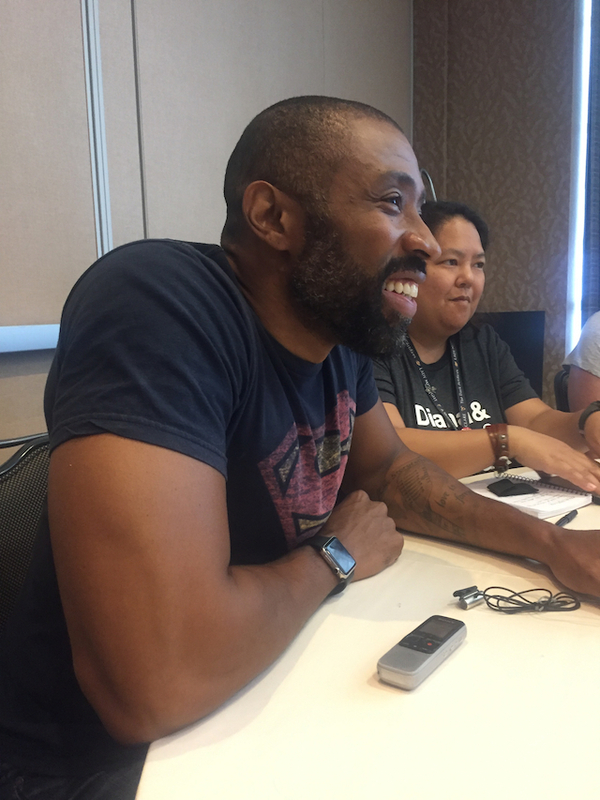 Cress Williams (Black Lightning): It’s an extreme honor. I’m a fan of superheroes, and there’s not a lot of black superheroes out there. It’s a dream come true of mine that I didn’t think was going to come true at this point. I can check this off the bucket list. I can’t wait. YH: How does it feel bringing this iconic black superhero to TV? Salim Akil (executive producer): It’s fantastic. Mara Brock Akil (executive producer): It feels like the right thing to do. It seems responsible and timely. 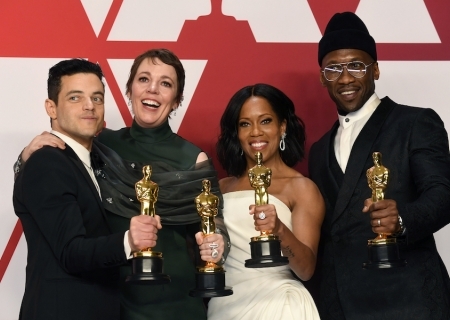 We’re slowly starting to see black characters in the genre itself, so you want to be invited to that party. We started to consider how images are powerful. They’re powerful because, when you can see yourself, you have to show up. They make you consider who you are and what you can do. If you remain out of the conversation and out of the storytelling, you will feel like you’re in the sidelines. That’s why I’m excited to have a black superhero who is a father, and to take back that narrative that black men are not in their family lives. They are. It may not look the way one wants it to, but they are there, and they are loving. And skipping to young black women, young black women are some of the most invisible women in media, in culture, and in society. Black men tend to get their needs met before we can even talk about our needs. So to see two young black women being raised and being empowered by a strong black woman and a strong black man is quite powerful. SA: They are the Obamas of the superhero world! YH: What are the overall themes of Season 1? SA: Accepting who you are. We’re going to stick to the themes of education and love. YH: Who is Black Lightning, exactly? CW: He kind of has two personalities. Jefferson Pierce is like Martin Luther King Jr, but with Black Lightning you get Malcolm X. He’s a family man. Family is first for him. Even as Black Lightning, he truly believes that education is the path for change. But the reality is, sometimes you need a little muscle, and you need a little grit to go with the gravy. He’s a dual purpose man. YH: Can you tell us a bit more about the family dynamics in the show? CW: That’s what separates the show. We’re based in a real city, and we’re based in real-life things. Ultimately he hung up the suit for his family and to keep them together. It’s kind of ironic that, nine years later, he puts the suit back on for his family. Family is the central part of it. 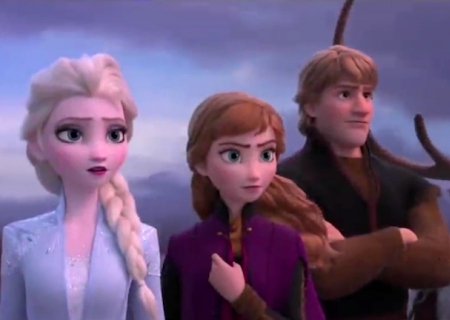 I say it’s a family drama with superpowers on top. SA: The number one thing is probably the most obvious, which is that they’re black. We all live very universal lives. The universal aspect of our show is already there. But I think cultural specifics will be interesting. What’s it like living in a community where there’s 125 shootings in one weekend? Most people assume that, in that community, everyone’s just carrying guns, but no. I grew up in a community like that, and we have to make our way through that, with joy and goals. I think that’s what makes it unique. That’s where we’re going to live, and that’s the stories we’re going to tell. That’s why this family is different, because they have to face that. In addition, Anissa is a lesbian, so we’re going to talk about those issues. Jennifer is a teenager, so we’re going to talk about the pressure of growing up with your dad as Obama. MBA: And let’s not forget about his ex-wife, Lynn! Her superpower is love, but has she fulfilled the things she wants to do? She is trying to pursue her strengths, and what she wants to do. YH: What has the training regiment been like for you? CW: It’s been an increase of what I normally do. I would normally work out five days a week, normally a couple of hours a day. Now I work out about 5-6 days a week for about three hours a day. In addition to that, I’m working in fight training as much as I can. It’s kind of weird, I actually like working out. Now I also get to say it’s my job, so leave me alone and let me work out. Nafessa Williams (Anissa Pierce): I have not started on the training regiment yet, but I am in the gym. I’m going in, so I’m prepared for whatever is coming! China Anne McClain (Jennifer Pierce): She [Jennifer] runs track, so I’ve been doing a lot of running. I’m probably going to have to get in with a coach to work out all my fighting skills. My character is very physical even before she becomes a superhero, because she is an athlete. I’m excited for that. I think it will make me feel more in character. YH: Will “Black Lightning” cross over with the other CW/DC shows? CW: It’s possible. As of right now, we’re not in the same universe, and our main focus is to develop and familiarize our audience with our characters. We want to get our audience into our characters and our dynamic. Something like that could happen later on down the line. NW: I’m open to the idea, but with this first season, we have a lot of ground to cover. There’s never been a black superhero on network TV, so we need to cover all the character dynamics. YH: What drew you to this part and how did you get involved? NW: I got the call for the audition and I read the part for the character, and I was obsessed. I knew in my heart that I had to play her. I loved how much of a strong woman she was, and how much she fights for what she believes in. I love that she’s an advocate for education like her father. We’re the first black superhero family on network TV, so I think to be able to give a voice to that is great. I feel that this show is timely and it’s needed. I didn’t have a black superhero to look up to as a little girl. I think I’m most excited that brown little girls will have myself and China as an image of themselves. CAM: I just love playing strong, female characters, especially being African-American. I think that it’s really cool that you get to see that on TV. When I got the character description, I knew I had to go in for it. It just seemed awesome to me, and who doesn’t want to play a superhero? YH: Will “Black Lightning” touch on any current political issues? NW: You’ll have to tune in and see. We haven’t yet. YH: What is the sibling dynamic between Anissa and Jennifer? NW: Like any big sister, Anissa just wants to protect her. She wants to stop Jennifer from making the same mistakes. I’m the oldest of four, so it’s really easy for me to tap into this character. I have two younger sisters, one who is a few years younger than China. China and I love each other, we have a lot of fun together, and we are obsessed with each other off camera. CAM: It’s very strong. Anissa is my protector at all times. We have a little bit of separation, because I’m young and I don’t want to listen to her. We have a bit of a strained family situation, so you will see that develop on the show. YH: What is Anissa like? NW: She’s a force of her own. She fights for what she believes in. I like to think, if I believe in something, I will fight for it. If she wants something, she will go out and get it, and not even her father can stop her. YH: What is Jennifer like? CAM: She’s the youngest daughter of Jefferson Pierce. At the beginning of the show, she has not gotten her powers. She’s just a normal teenager, getting into trouble, which is one of the reasons her father comes out of retirement. So you see her arc as she develops her powers. You will see her powers sooner rather than later. YH: If Jennifer were to come to Comic-Con, who do you think she would cosplay as? CAM: [laughs] That’s a great one. She runs track, so I would say she would come as The Flash. I would love to have that head gear. That would be cool! Check out “Black Lightning” when it premieres midseason 2018!